Tekele Cotton, right, runs down a loose ball against Tennessee's Jordan McRae. Wichita State won 70-61. The moment I realized last season that Wichita State was a potential Final Four team was when I was watching the then-banged-up Shockers practice on a snowy evening in late January. I watched Malcolm Armstead plow headlong into the lane at a scrimmage. I watched Cleanthony Early display some of the most effortless NBA-caliber moves youâll ever see at the mid-major level. I watched freshman Fred VanVleet show off the precociousness at point guard thatâs made him an invaluable asset to this program. I watched Ron Baker grimacing on the sideline, his left foot in a boot from a stress fracture, clearly itching to get back on the court. I watched the entire squad play with an intensity that seemed more fitting for a March conference tournament game than a January scrimmage. Head coach Gregg Marshall walked over to me. "What are you noticing from this team? " he asked. "You guys practice harder than any team I’ve seen," I replied. "Exactly," he said, smiling, then went back to riding them. What I saw that January evening — and what I kept saying about Marshall’s team from February and into March — was that Wichita State’s toughness, discipline and hard work gave the Shockers as much potential as any team for some Cinderella magic in March. Sure enough, they ran through defense-minded Pitt, high-scoring Gonzaga, upset-minded La Salle and a hugely talented Ohio State on their improbable run to the Final Four. The idea that Louisville’s eventual national title was destiny belies the fact that Wichita State nearly stole the national semifinal game, too, losing by four after having the game tied with three minutes to go. So what should we think about Wichita State this year, now that the Shockers are 16-0, ranked sixth in the nation, and about to play one of their toughest conference opponents, Missouri State, on Saturday? How about this: Wichita State has a real shot at ending the regular season undefeated — as good of a shot as any team since St. Joseph’s did it a decade ago. Think I’m crazy? So does Marshall. "We keep hearing that," he told me the other day. "It’s just not something we talk about. It’s foolish. Youâre setting yourself up for failure." If you’re the head coach, of course that’s true. You can’t buy into the hype about March when you are playing in one of the toughest road conferences in college hoops through January and February. But consider this: Last year’s Wichita State team was incredibly banged up. The Shockers only got healthy for March. This year? Baker has been playing through a serious ankle sprain — and that’s it. They’re clicking on all cylinders, and their 16-0 start is by far the best start in school history. The team might be considered mid-major — a phrase that ought to be discarded when dealing with always-successful programs like Wichita State — but its bloodlines are blueblood. On the roster are Andrew Wiggins’ big brother, Nick Wiggins, and LeBron James’ cousin, Darius Carter, one of the top junior college transfers in the country. And get this: Last year, Marshall kept telling me it would be the 2013-14 season when this team’s talent would come to fruition. Here we are, and Wichita State tore through nonconference play and is so far 3-0 in the Valley. And despite the fact the Valley is a brutal road conference — with tough, Big East-style basketball and with basketball-first schools where, when the sixth-ranked team in the country visits, it’s like that school’s Super Bowl â the past three seasons Wichita State has gone 30-8 on the road. That’s the best road record in the nation in that span. Wichita State is the Gonzaga of this year, a real threat for a No. 1 seed — except, as the Shockers proved last season, they have the makeup to go deep into March. They spread the scoring around, with four players averaging 10.2 or more points. In his sophomore year, VanVleet has quickly matured into a mistake-free point guard, ranking third in the nation in assist-to-turnover ratio while hitting 44.7 percent of his threes. VanVleet has a shot at the Larry Bird Trophy, given to the conference player of the year. 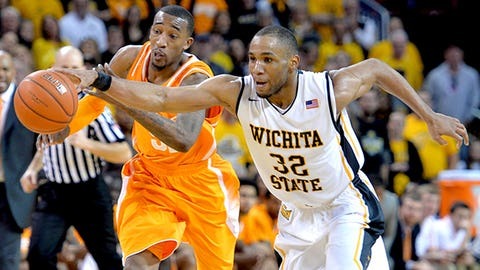 Wichita State has the sort of balance you look for in a team thatâll play well through the stretch run. KenPom.com has Wichita State ranked 13th in the nation in adjusted offensive efficiency and 20th in the nation in adjusted defensive efficiency. The website also pegs Wichita State’s chance at going unbeaten at 13.9 percent — a far better probability than the other four remaining unbeatens — Arizona, Wisconsin, Syracuse and Iowa State, all in major conferences. The only roadblock between now and March was some bad scheduling luck. KenPom.com currently has Wichita State at 12th in the site’s ranking system — the lowest of the five remaining undefeated teams. The next highest-ranked school in the Missouri Valley Conference is Indiana State, coming in at 52nd. The Valley is a middling 11th in conference RPI, stuck between the Mountain West and the Mid-American — which means the quality wins the NCAA tournament selection committee will look at when seeding teams in March will have come mostly from the Shockers’ nonconference schedule. The Shockers tried to schedule aggressively in November and December, but you know what they say about the best-laid plans. Wichita Stateâs top two RPI wins were against two expected NCAA tournament teams that have underperformed so far this season: Tennessee, a team that’s fallen short of its top-25 expectations, and BYU, which has already lost seven games. The Shockers also beat talented St. Louis and Alabama teams on the road, hard-fought wins that likely wonât register too high as RPI wins. Wichita State can hope teams like Tennessee or BYU improve in conference play to make those nonconference wins shine brighter. But these are things outside Gregg Marshall’s control. He doesn’t think about them. Just like he doesn’t think about the possibility of going undefeated. Until, of course, people like me ask. "We haven’t set a goal to be undefeated at end of year," he said. "People talk like that, but people who talk like that haven’t had to take their team into nine places on the road in the Valley and try to win games on the road. "We do as good job as any. I don’t want to diminish what we have, but it’s not like we take a bunch of five-star or even four-star recruits in there that were recruited by Duke and Kentucky. We don’t physically impose our will on people in our league. That’s not possible most nights. Because of that, we just can’t steamroll the league. No one in this league can. The best Creighton teams, the best Southern Illinois teams, even they couldn’t do that." Look: Even if Marshall believed his team had a shot at going undefeated, he wouldn’t say so. Not publicly. Not privately in front of his players. That’s where this team’s confidence about belonging with the big boys would cross over into hubris. I don’t have that problem, though. So here it is, one year after I called Wichita State as a Final Four-caliber team: I believe this team can go undefeated in the regular season. In fact, I believe this team will. Reid Forgrave, FOXSports.com Senior College Basketball Writer, has worked for The Des Moines Register, The Cincinnati Enquirer and The Seattle Times. His work has been recognized by Associated Press Sports Editors, the Livingston Awards for Young Journalists and the Society for Features Journalism. Follow him on Twitter @reidforgrave or email him at ReidForgrave@gmail.com.